Donald Trump accused a reporter Friday of making up her account that his campaign manager assaulted her as she was trying ask a question at an event in Florida. Michelle Fields of Breitbart News has said she was covering a Trump press conference at the Trump National Golf Club in Jupiter on Tuesday when she was yanked backward by the arm after asking a question about affirmative action. The Washington Post reported that it was Corey Lewandowski, Trump's campaign manager from New Hampshire, who grabbed Fields. "I watched as a man with short-cropped hair and a suit grabbed her arm and yanked her out of the way. He was Corey Lewandowski, Trump’s 41-year-old campaign manager," Post reporter Ben Terris wrote. "Fields stumbled. Finger-shaped bruises formed on her arm." Politico also published audio and a transcript that purportedly captured the moment and the aftermath when Terris and Fields talked about the interaction. But Trump said, following Thursday's GOP debate in Miami, that he'd been told "nothing happened." "I wasn't involved in it but the Secret Service was surrounding everybody," Trump told reporters. "They said nothing happened. Everybody said nothing happened. Perhaps she made the story up. I think that's what happened." Video of the moment that has emerged does not clearly show where Lewandowski or someone else made contact with her, NBC News reported on Friday. A police report about the incident has been filed and an investigation is ongoing, the Jupiter Police Department confirmed to NBC News. Trump campaign spokesperson Hope Hicks earlier issued a statement denouncing the accusation, saying it was "entirely false." Hicks said she was present at the time and did not witness the encounter, and noted that "not a single camera or reporter of more than 100 in attendance captured the alleged incident. 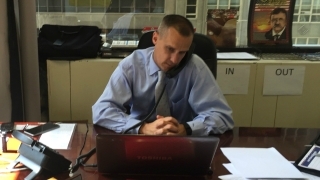 Corey Lewandowski, of Windham, New Hampshire, is Republican presidential candidate Donald Trump's campaign manager. "This individual has never met Corey, nor had the only reporter that supposedly identified him," she added. "There are often large crowds aggressively seeking access to Mr. Trump and our staff would never do anything to harm another individual, while at the same time understanding that Mr. Trump and his personal space should never be invaded." Lewandowski took to Twitter to label Fields as "an attention seeker" and has questioned her integrity. "I never touched you. As a matter of fact, I have never even met you," he tweeted. In response to the Trump campaign's denials, Fields tweeted out a photograph of her arm, which appeared to be visibly bruised. "We stand behind her reporting, her techniques, and call again on Corey Lewandowski to apologize," Breitbart CEO Larry Solov said in a statement, NBC News reported. The news outlet has since published a story suggesting Terris misidentified Lewandowski as the person who may have made contact with Fields. Many members of the national news media have come to Fields' defense, tweeting out messages of support for her. What happened to @MichelleFields could happen to any reporter or attendee at a Trump rally, unless Trump is forced to change his culture. Shep doing a segment on Trump. Mentions his desire to reach out to women. No mention of Trump's campaign manager assaulting one. So Corey Lewandowski told Breitbart he didn’t realize it was a Breitbart reporter he’d grabbed... but now Trump camp says nothing happened? Donald Trump to Corey Lewandowski: You're Fired! This was not the first time a journalist has said they were roughed up at a Trump event. A Secret Service agent and a Time magazine photographer were involved in a scuffle on Feb. 29 in Virginia. The Inspector General for the Department of Homeland Security has opened an investigation into that altercation, according to Time. There have been other incidents at Trump's events with protesters being ejected from rallies, including Rakeem Jones, 26, who was punched in the face by a Trump supporter on Wednesday as law enforcement officers were escorting him out of a campaign rally in Fayetteville, North Carolina. John Franklin McGraw, 78, was charged with assault and disorderly conduct after the rally. Speaking during a news conference Friday about violence at his rallies, Trump claimed that one protester at an event had been swinging punches "and the audience hit back." "And that's what we need a little bit more of," he added.